With hundreds of transactions occurring each day at your marina, bookkeeping can be a pain. Luckily, Dockwa does this heavy lifting on dockage transactions, so your accountant doesn’t have to. 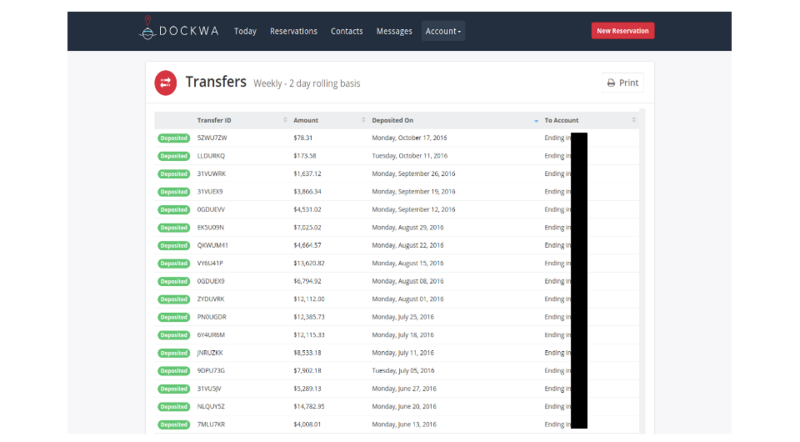 When Dockwa dockage payments are deposited into your bank account each week (or month) you receive a Dockwa Transfer Report, that sums and and categorizes all Dockwa transactions from the week. Your accountant will also be able to the itemized list of individual boater transactions. The rolled-up view of payment removes the need for your accountant to spend time summing individual transactions, while the itemized list is always available for them to assess. Let’s take a look at how your accountant can find and use the Dockwa transfer report for easy bookkeeping. On your marina’s scheduled payday, you’ll receive an email letting you know that you’ve received a deposit of boater payments. 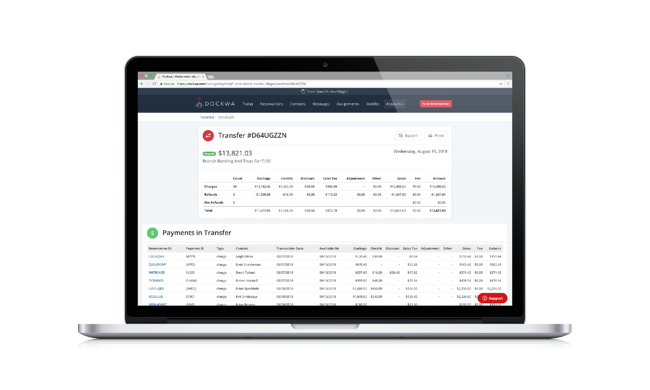 To review the details of your payment, head on over to the “Transfers” section of your Dockwa Dashboard. Here you will find your list of historical transfer reports. For each report, you will see the amount of money that was deposited, the date that it was deposited, and the account to which it was deposited. Click into a specific transfer report to access the details of the report. At the top, you will see the roll-up of all transaction types, divided into Charges and Refunds: Dockage, Electric, Discount, Sales Tax, Cancellation Fees (“Adjustments”), and the Dockwa Processing Fee. In other words, you will see in one glance the total payment deposited into your marina’s account and of what that deposit is comprised. 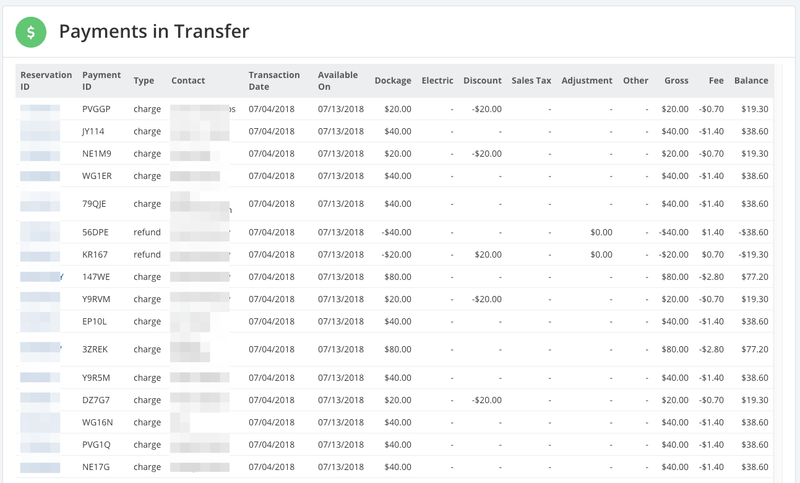 Below the roll-up view of transactions, you will see every individual charge and refund associated with the roll-up view. 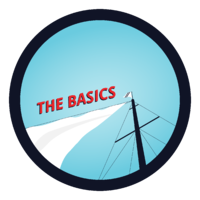 Clicking into a boater’s payment here will show you the specifics of the transaction, including the reservation number, line items added (dockage, electric) and line items removed (discounts, refunds). What your accountant will most likely care about, however, is the ability to export this transfer report for use in their accounting system. When you click into an individual Transfer Report, you will see “Export” and “Print” buttons in the top right corner. Clicking “Export” will send an Excel file to the email address associated with your Dockwa account. The first tab of this file will contain the rolled-up report and the second will contain the fully itemized report. This file is formatted in order to work with any accounting system and/or software your accountant may be using to balance your marina’s books. 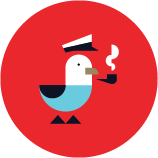 "Dockwa's support team in incredibly helpful and Dockwa works well with out accounting team for easy bookkeeping." If you have questions about transfer reports (or any other Dockwa-related questions! ), learn who to contact in our next lesson.